Google’s got a new project that will presents Internet connections to remote areas in the world using air balloon. The project named “Project Loon” is intended also to the arena of natural disasters that his Internet access are cut off. “The balloons ‘Project Loon’ flying in the stratosphere, twice the altitude of the aircraft and weather. That Balloons surrounds the Earth aided by the wind, “Said of the Loon Project Team Google in the official site. Strastofer is about 20 km above sea level. The Google team estimates, wind speed at the layer of the stratosphere is quite stable between five to 20 metres per hour, with each layer of air height has a variation of wind speed and direction as well as magnitude that are different. 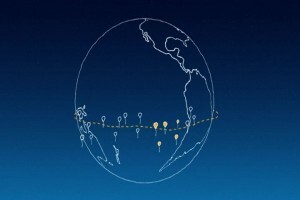 “Project Loon” anticipating the direction of motion of the Internet balloons can be controlled by adding or subtracting an altitude where the wind leads to the desired area. Addition or subtraction of altitude is done from Earth armed with the software algorithms that are connected with the solar panels on the balloon, said the team. “People connect to the Internet network on balloon with a special Internet antenna installed in their buildings,” call the team “Project Loon”. Internet signals moving from one balloon to another balloon and to the global Internet network and then end up going back to the Earth. Each balloon can transmit Internet signals in area with diameter 40 kilometres at speeds equivalent to a 3G network. “Project Loon” currently using ISM frequencies, in particular the frequency of 2.4 and 5.8 GHz, which is available for everyone to use. The material on the Internet balloons that are made of heat-resistant polyethylene plastic measuring 15 meters and 12 meters high. Solar panels under a balloon capable of providing electrical energy a 100 watt to light electronic box under the panel. Electronics box that contains a radio antenna to communicate with other balloons as well as antenna Internet Earth and control systems for balloon motion. Google is currently try testing about 30 balloon Internet in New Zealand, and has not been mentioned when the balloons were spread throughout the hemisphere. Related to "Google Fly Internet Connection Balloons"